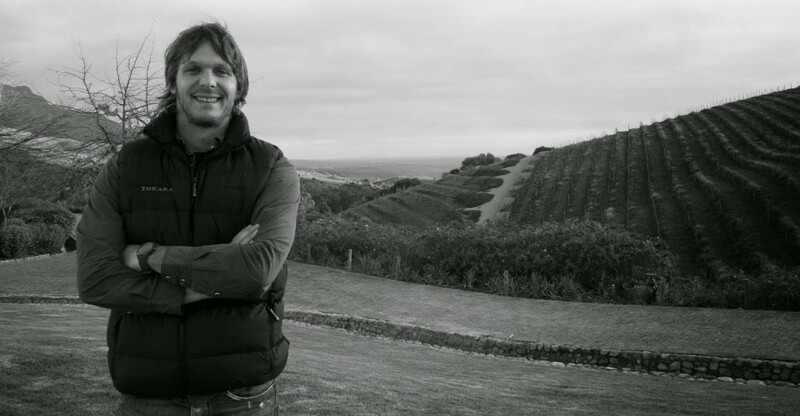 Miles Mossop’s day job is as winemaker at Tokara, a high profile estate that sits atop the Helshoogte Pass between Stellenbosch and Franschhoek. The agreement Miles has with GT Ferreira, the owner of Tokara, allows him to vinify 10 tonnes of bought in grapes and put them under his own label each year. There are effectively three wines produced under the Miles Mossop name. The white wine, called Saskia, was first produced in 2004. It has remained pretty constant in its source and the make-up of the blend from the start. It is effectively two-thirds Chenin sourced from 30 year old Stellenbosch vineyards, and one third Viognier sourced from vines farmed by Willi Mostert on the Paardeberg side of the Swartland. More recent vintages have seen the (beneficial) addition of a barrel or two of Verdelho and Clairette, which with their lower alcohol and well-defined acidity, have made the blend a lighter stricter and more linear. All the components are fermented individually in older barrels and left on its lees for added complexity. Blending is only completed just prior to bottling. The Chenin generally goes through a partial malo-lactic fermentation, whilst the Viognier enjoys a full conversion. The wine is named after Saskia-Jo, Miles and Samantha’s elder daughter. In 2006, the accompanying red wine was launched. Max, named after their son, was a 6,000 bottle blend from the 2004 vintage, made up of Cabernet (56%), Petit Verdot (22%) from Bellevue in Stellenbosch, and Merlot (22%) from Zelma Long’s Vilafonté vineyard in Paarl. The wine spent a total of 20 months in 40% new French oak and won a Gold Medal at the well-respected Old Mutual Trophy Show. The blend for the 2005 was 56% unirrigated Cabernet Sauvignon from Bellevue, 20% Petit Verdot from the same source and (since Vilafonté built their own production facility and Miles was no longer making their Merlot component at Tokara), the source was replaced by fruit from a friend’s farm in Banghoek valley, a relatively cool location off the Helshoogte Pass. This also means that since the source for the Merlot switched, the wine was also entitled to the Wine of Origin Stellenbosch appellation. Subsequent vintages have all been drawn from the same vineyard sources, although the 2009 and 2010 vintages have seen the introduction of a small portion of Stellenbosch Malbec to the blend. The addition of a third infant to the family (in 2009) naturally resulted in a commensurate increase in the range of wines. Kika joined Saskia-Jo and Max in the guise of a Chenin Blanc Noble Late Harvest, is sourced from the same Stellenbosch vineyard as the Saskia fruit. Only one or two barrels are produced each vintage from seven rows of berry-selected and purely botrytis-affected grapes. The resulting wine is light and delicate on the nose yet lush and ripe on the palate, carrying around 180 grams of sugar admirably.